Last month when I read my friend Julie’s post about Spring Pin-spiration with McCormick I was instantly intrigued. I browsed through the McCormick.com Look Book and started my own “McCormick Pin-spiration” board on Pinterest. One of the first recipes I pinned was this Creamy Pepper Dressing. I’ve been making an effort to make more homemade salad dressings this year and buy less processed. I’ve made this creamy pepper dressing 3 times now! I love this creamy dressing and now I have no need to ever buy a bottle of ranch dressing again. This recipe suffices the processed dressings by far, and it’s so incredibly easy to make. No one has excuses. Stop buying processed dressings and make your own people! 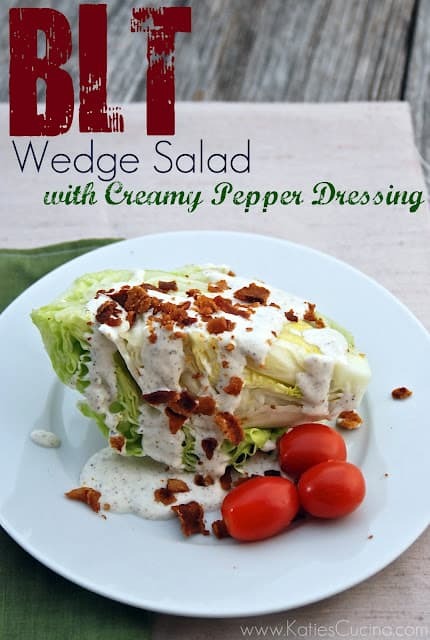 The first time I made the Creamy Pepper Dressing I knew it would be great on a wedge salad. I hadn’t made a wedge salad in years. Frankly, because I never buy iceberg lettuce. I grew up on iceberg and when I moved out of my parents house I stopped buying and for the most part consuming iceberg lettuce. I branched out and started using a wide variety of leafy greens–not just iceberg! While I was shopping yesterday at my local produce market I decided to buy a head of iceberg lettuce. I knew I wanted to make a wedge salad. I figured it would make for a nice dinner salad; however, by the time I got home it was later in the afternoon and both my husband and I were starving. So I whipped up this wedge salad and dressing for a late-lunch. I loved the flavors of this salad. It instantly reminded me of a BLT (without the bread). To my surprise, my husband had never heard of a wedge salad before!??! What? I was in shock and glad I could introduce him to the world of wedge salads. He does love his veggies, but his comment to me was “I feel like a cow eating in a field of grass“. Apparently, the wedge was too much lettuce for him. I think he has come accustomed to my typical salads I make that have 10+ veggies in it. Although, he did say it reminded him of a BLT, too! Using a frying pan, fry the four slices of bacon until golden brown and crispy. Place on a paper towel, and set to side to cool. In a medium bowl mix mayonnaise, sour cream, milk, cider vinegar, McCormick® Black Pepper, McCormick® Garlic Powder, and McCormick® Onion Salt until well blended. Set aside in the refrigerator until your ready to use the dressing. Rinse the head of iceberg lettuce and cut into 4 wedges. Place on 4 individual plates, top each wedge with creamy pepper dressing. Crumble one slice of bacon over the top of each of the wedges of lettuce and place 3 grape tomatoes on the side. 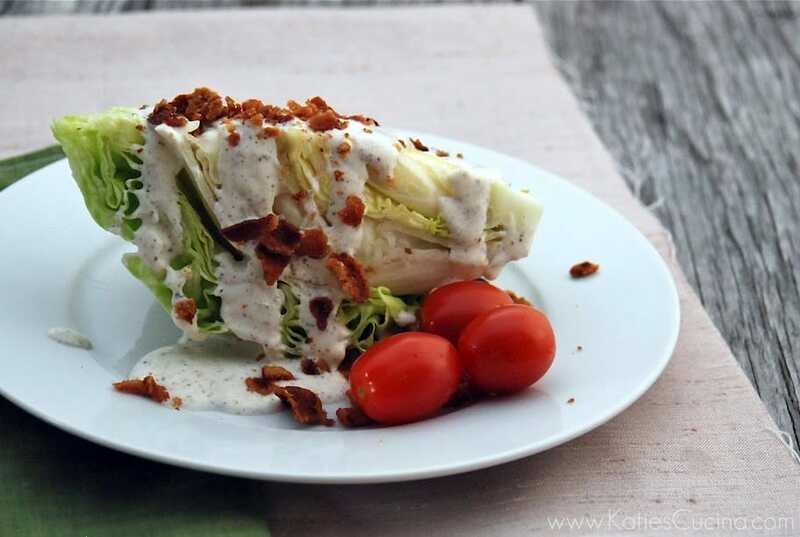 This looks great – Hubby loves a good wedge salad and I love making my own dressings. We need to try this one! Then you should most definitely try this salad! That looks wonderful! So simple and delicious. Can’t wait to try that dressing. Thanks Christine! I agree–super simple meal to put together! Oh they have wedge salads?!? I can’t tell you the last time I ate at a Fridays! i love a good wedge salad! can’t wait for our lettuce to come up in the garden – this may be the first salad i make. Pingback: Is it True that You Shouldn’t Cut Lettuce with a Knife?